How Do Rodents Get in My Attic? Do you hear a scurrying sound in your ceiling? If so, you may have rodents in your attic. Rodents are very creative when it comes to entering your home, and it’s crucial you have them removed in any case. Removing rodents from your attic is a delicate process. Rodents are very smart and good at hiding, so they can be difficult to catch if you don’t know what you’re doing. A rodent removal professional will use proven techniques to locate rodents in your attic and devise a plan for getting them out. This includes eliminating their nesting areas and food sources. Once your attic is free of rodents, it’s time to focus on prevention. The first step in rodent prevention is inspecting the home for any potential weak spots. We will fill the small holes in your attic, replace damaged insulation, and sanitize your attic. These necessary steps will ensure your home stays rodent free. 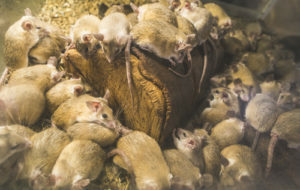 If you have a rodent infestation in your attic, don’t try to handle it yourself — call the experts at Critter Control® Miami. Our team of rodent removal experts are trained to locate and identify rodents in your attic, remove them, and prevent future infestations. To schedule a free inspection, call (305) 258-3587 today.